At various times this year, people have asked me, “James, what do you think about December 21, 2012 and the end of the Mayan calendar thing?” My honest response is that I don’t really think about it that much. Various astrologers have said that there’s no particularly interesting planetary alignment tomorrow, it’s simply Winter Solstice as it always is. I love this. For me, the natural ebbing then growing of light as the seasons progress is one of the most elegant and reliable rituals. I plan to honour the Solstice with my partner and a few other close people, but not get caught in the New Age “end of things” energy. I truly hope that it’s the end of the way that our culture has been. Thousands of years of patriarchy, power-over, fear-mongering in the name of religion, and abuse of one another and our planet aren’t exactly humanity at its finest. However, I don’t expect sizzling fireballs and whooshing waves to engulf us. I don’t anticipate any saviour(s) from the sky. We’re it. We’re the ones we’ve been waiting for. If any shift will happen, it will because we’ve made that choice today, tomorrow, and as often as possible. I do expect to see a lot of 2012-themed books in bookstore bargain bins from December 22 onward as people realise that life goes on. Yes, we need myths by which to live, but let’s be discerning about them. One of my hopes about tomorrow is that someone with apocalyptic tendencies doesn’t latch on to the theme and do something harmful with it. Let’s simply be with Nature’s rhythmic procession of deepening night and birthing sunlight, noticing and celebrating where we’re mirrored in that progression. What does the Chariot, reversed say through YOU about December 21? Yesterday, 20 children and six adults were shot dead in a school in Newtown, Connecticut and 22 children were stabbed (but lived) in Beijing, China. These shocking events are leaving people numb, enraged, sorrowful, confused. At first, I thought, “You know what? Maybe the world blowing into dust on December 21, 2012 wouldn’t be such a bad idea after all. Then Life could start over and do a better job.” Then, I remembered a phrase that teacher, shaman, ceremonialist, and musician Chris Reynolds said to a group of us last week: “When you don’t want to be here, it’s an act of violence toward the Earth.” Remembering that moved me to tears and snapped me out of my cynicism. We need to process the trauma and grief. Each of us has ways to do so in the face of such moments. My own ways include using the tarot to help sort out my thoughts and feelings, journal writing, and being in collaborative conversation with peers. Here, my intention is to offer what came to me as I asked questions and drew tarot cards from the 1JJ tarot deck. Please feel free to join the conversation in the Comments section. It’s a highly charged event, so let’s please honour each other’s point of view and simply comment on the questions, cards, and responses. Thank you in advance for that. What is the root cause of events such as what occurred in Newtown and Beijing yesterday? XXI, The World, reversed. Feeling that the various aspects of self are separate or fractured. Being caught up in one’s own inner world without noticing others. What is our first step in healing that separation, fracturing, and lack of awareness of others? 5 of Pentacles, upright. Make changes in health programmes. Interrupt patterns of physical violence or abuse. What resources can help us to make those changes? 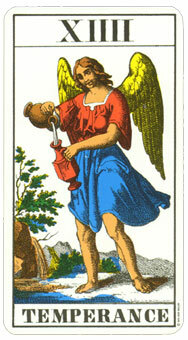 XIIII, Temperance, upright. Inclusivity and integration, making art, willingness to find unity and commonality, meetings between people and groups who don’t usually mix together. What is our least healthy or least helpful response to yesterday’s events? 8 of Pentacles, upright. Stinginess with tangible resources. Cutting back anything health-related. What is our most healthy or most helpful response to yesterday’s events? XI, Strength, reversed. Do what’s necessary to survive emotionally. Use our strongest inner coping mechanisms to ensure psychological survival. What do the survivors of those events most need from us at this time? King of Pentacles, reversed. The termination of our unconscious suicidal tendencies. A willingness to disengage from our outworn security platitudes. What questions are we invited to carry with us as a result of yesterday’s events? 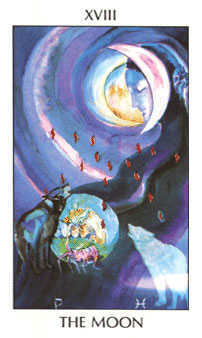 4 of Cups, reversed. What addiction(s) am I tempted to act on? What steps am I willing to take toward healing and recovery? How can I embody my relationship with the Great Mystery in this moment? How can I demonstrate self-love here and now? What does acting with depth and intimacy really look like? Today is 12 – 12 – 12, the only time in our lifetime that these numbers will configure like this on the Western calendar. A lot of people are speaking of whatever significance this has. Therefore, what does 12 – 12 – 12 signify for me? Nothing. It’s simply another day on Earth. Let’s get on with living it. What’s Next on Your Path? Please Join Us! Both the tarot as James Wells works with it and ADIEWA practices developed by Sue Guttenstein with Jane Lindsay are intended to bring into conscious awareness that which is difficult to access with our day-to-day ways of being. We can then be present with this information in non-linear, deeply intuitive and embodied ways to guide us toward and through change. We believe that this way of working together will allow you to access in a deep soul way what is next on your path of transformational work and then, if called for, to work through any contractions that may be present in order to clear your way forward. My partner, the two young people in our life, and I went out for dinner last night. “So what?” you might ask. Well, when the young people are with us, we usually have dinner at home. It’s often (not always) a time to have some food before getting on with something else, not always together. Last night was different. Sitting in the restaurant booth, enjoying our pad thai, spring rolls, and sushi, we really spent time together. We shared silly jokes, some conversation about what’s going on in our respective forms of education or work, and hopes and wishes for the coming year. One member of the group had had a stressful situation earlier in the day, so we held a brief round of listening council around the question, “What does each of us know how to do in order to calm ourselves in difficult situations?” We learned more about each other’s resourcefulness and, I hope, expanded our own resources. What was different? I feel that we were more deeply engaged because we took ourselves out of our usual setting, away from our usual distractions and activities. There are many ways to set up such conditions. Creating a conscious structure such as circle process allows people to relate more attentively and respectfully. Going on retreat in a beautiful natural setting provides a respite from the buzz and roar of everday life so we can listen with more care to ourselves, one another, and the more-than-human members of Earth. Meeting at a nearby tea shop can make sure that we don’t have to attend to the minutiae of food and beverage, so we can visit with less interruption. For me, all of these ways, and more, are ways of being in council. They’re not necessarily about escaping from the world, but rather they’re about growing cells of heart and connectivity in the midst of a culture that’s top-heavy with head and separation. The more of these cells we cultivate, the more grounded, sane, and healthy we can be, as individuals AND as a species. So, our dinner out last night was much more than dinner out. It was a bit of good medicine. What about YOU? In what ways do YOU cultivate heart and connectivity? What takes YOU out of the routine and into conscious sharing time? Please tell us. We’re listening. I’m designing a new business card/brochure/postcard for my tarot work. Here’s the text I’ve come up with. What do YOU perceive as you look at the text? What experience do you imagine taking place as you read the words? Please let me know in the Comments section of this blog entry.